neil hilton wrote: That 'turret hit rule' for the RN ships is a huge generalisation, assuming you're refering to the BC disasters at Jutland (Queen Mary, Indefatigable and Invincible). Historically the designs were sound for BCs, but the crew purposely removed the safety systems in order to increase rate of fire. Beatty ordered this on all his squadron. The rest of the British Fleet had all their safety systems intact. I should point out that Warspite (and the others of the QE class, 5th Battle squadron) all went through exactly the same gauntlet as Beattys BCs and out the other side with only minor..ish damage and having given more than they got. So, really that 'turret rule' you had should have been specific only to ships commanded by Beatty not the whole RN. How would your 1928 Great Banana War have turned out then? I bet the Hood might have blown up. So could her sisters. Maybe not the big new British BCs and BBs though. If Beatty ordered 'the safety systems removed' "on all his squadron", someone forgot to tell the turret crews in his own flagship. I forget if it was the exec or the gunnery officer of that ship who pissed off the turret crews by making them handle the charges more carefully. It wasn't just the gun crews piling up charges for the shells that made the British BCs vulnerable, it was also the type of propellant used. And also the more lightly armored turrets, barbettes, hulls, etc., enabling the shells to burst near those exposed charges more readily. Getting back to the topic at hand, these ships might have been formidable had they been built, but some of them look worse than the damned Gangut! Didnt Hood blow up because her Above the waterline torpedo tubes get hit? The exact way she blew up is still being debated, but by far the most plausible explanation seems to be she went the same way the Queen Mary did, by way of a shell hitting the 4" magazines, blowing them first and setting off the adjacent 15" magazines. Only of course in the Queen Mary it was the forward magazines. The best reason in my opinion for this being the way, was the phenomenon of the explosion seeming to come from the base of the mainmast and even further forward. The 4" magazines were right next to the larger, more open engineering spaces with the vents located around the mainmast. The subsequent 15" magazine explosions would have vented right through behind it far more readily than through all the armor, turret structures, smaller compartments, etc. Though of course everything did get blown to hell within a few seconds anyway. 19kilo wrote: Didnt Hood blow up because her Above the waterline torpedo tubes get hit? Furthermore, the exact sequence of events leading to the destruction of the Indefatigable are still in question. We do know this was the first of three exploding battlecruisers at Jutland, and the big explosion was probably from the forward magazines. 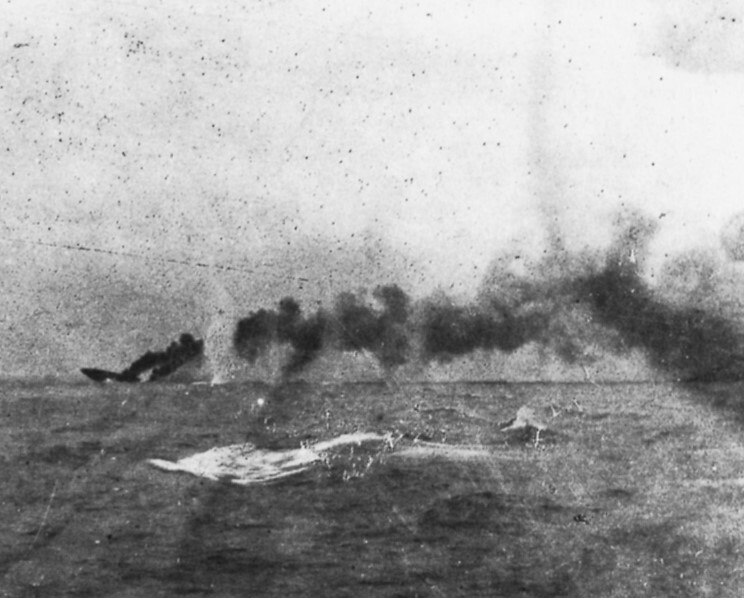 But the last picture of the ship, taken just before that explosion, shows the Indefatigable well on her way to sinking, the bows high up, the stern nowhere in sight. We do know the ship suddenly steered out of line under visible distress, just before the last explosion. I suspect a rear magazine hit, very low down (so the force was primarily vented downwards and less obvious to the other ships than the second explosion), somehow blew the bottom of the Indefatigable out. The ship was for all intents and purposes sunk before the big bang everyone really paid attention to. Of course that explosion was no doubt due to the charge handling. So if we also agree with the most plausible reason for the explosion of the Queen Mary being the forward 4" magazine being hit and exploding first and taking the main magazine with it, the explanation given that the British ammunition handling was the primary reason for the loss of all three battlecruisers becomes a bit less apparent. But then it also sounds as if the Queen Mary's Q magazines may have gone up as it was sinking, as well. That would presumably not have been due to charge handling, unless there were fires and the loose charges were flying in all directions as the ship reared up. I don't buy the reported breaking in half of one of Q turret's guns, I am thinking it fell into the trunnion pit or whatever somehow. The floor of Q turret bulging up well before the Q magazine explosion, sure, that could have been due to the severe structural distortion following the destruction of the entire forward half of the ship. German shells probably hit the port shelter deck above the forward 4-in. gun battery, exploded within the battery and set off large amounts of 4-in. cordite charges stacked for ready use. The flash from this would have gone down the ammunition hoists to the 4-in. magazine, with..........unfortunate results. This is a much more likely scenario than a penetration to the 4-in. magazine. Although it can never be ascertained precisely what set off the fatal chain of events on those 3 unfortunate ships, the most likely reason is faulty ammunition handling. I believe that this is also the conclusion drawn by the Admiralty at the conclusion of their investigations. What book did they come from? Djoser wrote: If Beatty ordered 'the safety systems removed' "on all his squadron", someone forgot to tell the turret crews in his own flagship. I forget if it was the exec or the gunnery officer of that ship who pissed off the turret crews by making them handle the charges more carefully. Add the armoured cruiser HMS DEFENSE. Add the armoured cruiser HMS BLACK PRINCE. I would also add the super-dreadnought HMS MALAYA and the battlecruiser HMS LION -both narrowly escaping the same fate furing this battle. Handling practices are appaerently not very decisive in creating conditions for a massive powder conflagration. There is a statistically significant relationship between a turret or it´s barbette getting hit and these catastrophic explosions. The ship´s of the 5th BS and the dradnoughts of the GF avoided getting hit on the turrets or barbettes. One 6in taking out a 15in barrel on WARSPITE and another hit deflecting off from the turret roof are the exceptions, but in both cases the explosive effect was completely outside the turret or barbette. No charge catching fire could have been involved in them, as no armour holing happened. The cases of MALAYA and LION to survive the events are well illustrating the problem in my mind. With the eplosive effect partly inside the exposed vitals charges caught fire and flash was spreading through the ammunition paths. The flashproof doors installed there were not pressure proof and thus little useful to protect the magazines against the rapid creation of pressure caused by cordite fire. Brave individual actions removing smouldering fragments from powder bags in the magazines of MALAYA and immediate flooding of the magazines (LION) rescued these two. There is no dount that both ships would have followed suite without individual interruption of the chain of events. Cordite therefore was an issue. Compare this behavior with german BC´s getting hit on their exposed vitals. There are numerous cases of turrets knocked out and secondary gun positions hit, some without and other with explosive effect partly inside them (through holing) but in only one case the ship was really endangered (SEYDLITZ off Doggerank). To Delcyros's list must be added HMS KENT, which suffered a substantial ammunition fire among ready use ammunition at a secondary casemate gun position during the Battle of the Falklands that flashed down through a hoist to her elow-deckammunition passage and nearly resulted in her destruction. This event was the first to draw the attention of the Admiralty to the danger of excessive amounts of ready use ammunition being held at the guns and precipitated a cautionary memorandum being issued to the fleet on the subject. HMS Good Hope built 1901, HMS Black Prince built 1904, HMS Defence built 1907, HMS Kent buil 1903. All pretty old ships by WW1 I'm not surprised they almost blew from magazine explosions, their designs were 19th century! No better and no worse than contemporary ships of other nations. Flash suppression with regards to magazine protecting doors is, to put it with brutal honesty, a matter of percentages. A standard flashproof door will keep most explosions out most of the time. An overpressure system incorporated will be more effective but it does result in an even slower transit of munitions to the turrets. Did any nations ships have overpressure anti-flash systems on their magazines in WW1? As for the numerous reported hits on the vitals of the Imperial German BCs in WW1, where these actually in the right locations to cause potential magazine explosions? A hole in the turret armour does not mean the flash definately will set off the magazines if there is nothing to stop it (although there is a significant chance it will).